The Skumole Shack property in Downtown, Vice City, as depicted in Grand Theft Auto: Vice City. The same shack in Grand Theft Auto: Vice City Stories, with a less damaged interior. 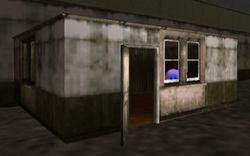 The Skumole Shack is, to put it simply, a dilapidated shack in southeastern Downtown, Vice City, prominently featured in Grand Theft Auto: Vice City as one of the player's safehouse. While technically reachable only after unlocking mainland Vice City following "Phnom Penh '86", the Skumole Shack, like the Hyman Condo, is in fact available from "In the beginning..." onwards, and can be purchased early if the player manages to reach the mainland via unusual methods. The shack is located on the rooftop of a store in southeastern Downtown, which is strategically located opposite to the biker gang's Greasy Chopper bar towards the south, where the player may receive missions from Mitch Baker. The small shack is simply a burnt out remnant of its former self with the interior presumably gutted by fire; the shack is also completely devoid of furniture, so without the most basic amenities it would not make for a good living space in the least. Given its size and condition, the Skumole Shack is very cheap, selling at only $1,000. The "skumole" name is a play on the phrase "scum hole". 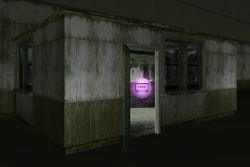 The shack as depicted in Grand Theft Auto: Vice City Stories features an undamaged interior; a rampage is available inside. This page was last modified on 26 September 2012, at 00:11.